Aviation Updates Philippines - With the arrival of the Airbus A350-900 XWB in Manila today, Airbus will demonstrate the capabilities of the aircraft to Philippine Airlines and Cebu Pacific. In a few days during its sales pitch, we are about to find out if one of the leading air carries in the Philippines will order the A350. The next-generation aircraft, Airbus A350-900 XWB (extra-wide body) can accommodate 315 passengers in a two-class seat configuration and is capable of flying of up to 7,750 miles. It entered commercial service in January 2015 with its launch customer, Qatar Airways. SPACE AND COMFORT. Economy Class area of the Airbus A350. 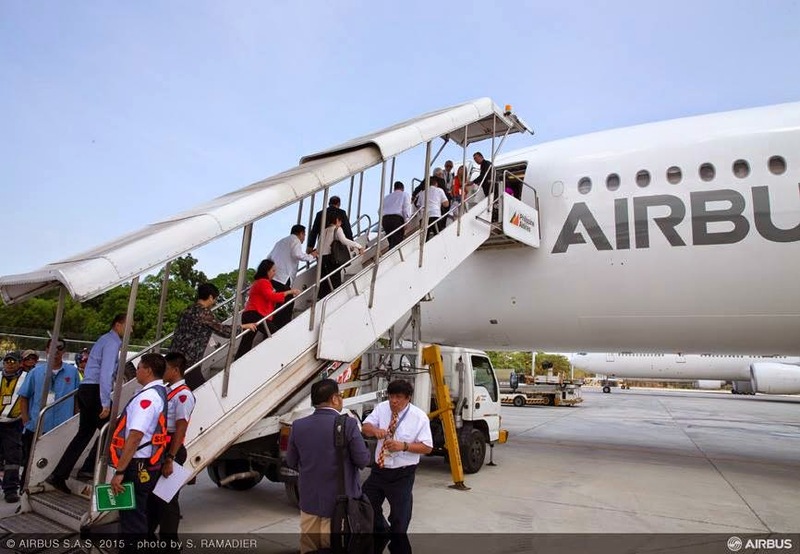 Philippine Airlines is carefully studying the capabilities of the next-generation aircraft. The flag carrier will possibly take an order of the A350 as it is searching for replacements of its aging Airbus A340-300 leased from Iberia (airline). Philippine Airlines' Airbus A340 fleet is in-efficient in fuel and is also costly to operate. According to its passengers, the A340 already shows signs of aging and it lacks in-flight services. The Airbus A350 competes with Boeing's 787 Dreamliner as airlines in the Asian region orders both aircraft as they switch to more fuel-efficient planes. The A350 boasts 25% less fuel burn, emissions, and lower maintenance costs. The aircraft has more space for its passengers in all classes. Airlines are able to install flat beds in its business and first class section due to its wide fuselage size compared to its competitors. It has large windows and overhead compartments. Airbus will perform demonstration flights for Philippine Airlines on May 21 and Cebu Pacific on May 22. The manufacturer will be meeting with the officials of PAL and Cebu Pacific on the scheduled dates. The Airbus A350 will leave Manila on May 24, 2015. At posting time, no orders were made from the Philippines. Leading budget carrier, Cebu Pacific Air, seems to be less interested of the A350 as the airline does not need its long-range capability. The budget airline currently operates six 436-seat Airbus A330-300 aircraft that it capable of flying up to 5,000 miles.